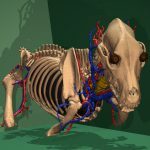 Inspired by the Visible Human Project, the Faculty of Veterinary Medicine of the Ludwig Maximilian University of Munich launched the Visible Animal Project (VAP). 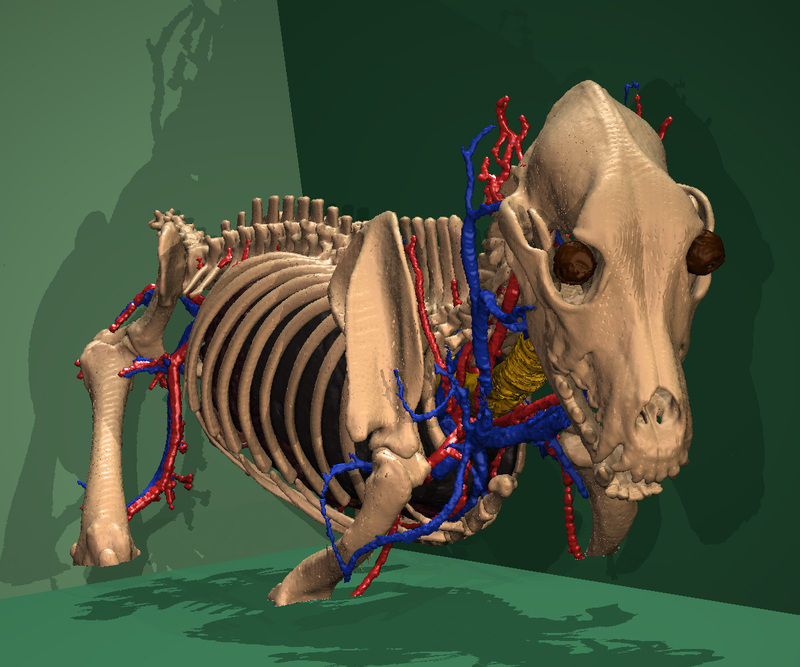 Within the scope of this project, the Visible Dog, a three-dimensional data set of a beagle, was created. The data include colored cryosections (photographic cross-sectional images of the frozen body) as well as CT and MRI cross-sectional images. 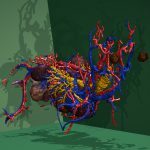 From these data, a 3D model of the dog’s anatomy was created using the Voxel-Man visualization system. 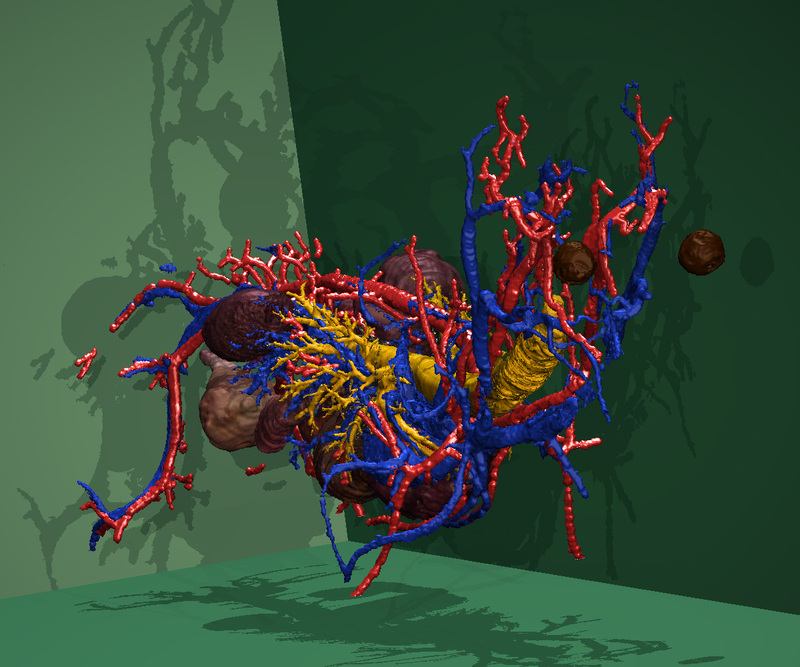 The following image sequence shows a gradual peeling of the model from the superficial musculoskeletal system to the major blood vessels, bronchi and internal organs. The following illustration shows the internal organs in a lateral view. In shape, relative size and location they differ substantially from the human anatomy. For better visibility, the left ribs were removed with a sagittal cut. 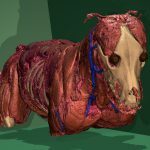 Peter Böttcher: The Visible Animal Project: Virtuelle Realität in der Veterinäranatomie. Dissertation, Tierärztliche Fakultät, Ludwig-Maximilians-Universität München, 2000. 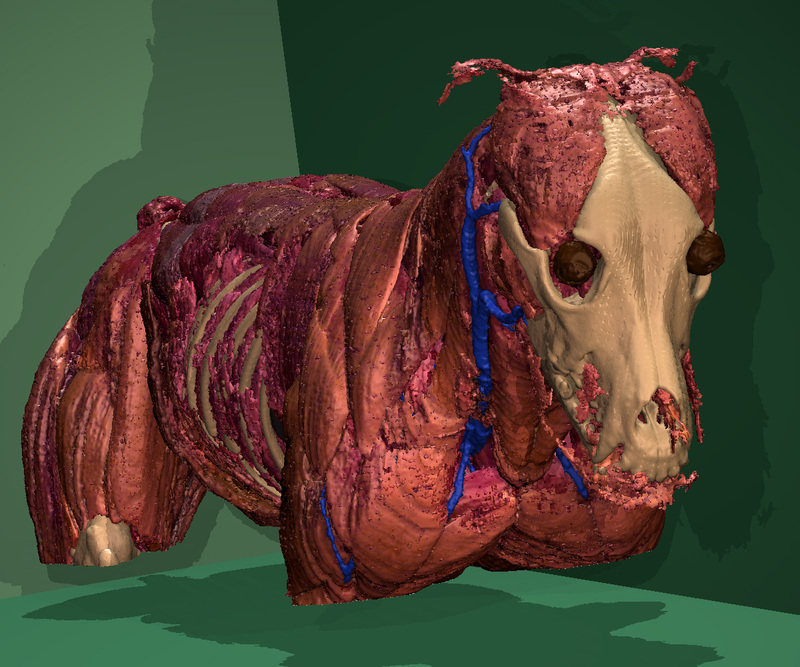 Peter Böttcher, Johann Maierl, Thomas Schiemann, Cristian Glaser, Renate Weller, Karl Heinz Höhne, Maximilian Reiser, Hans-Georg Liebich: The Visible Animal Project: A three-dimensional digital database for high quality three-dimensional reconstructions . Vet. Radiol. Ultrasound 40, 6 (1999), 611-616. Thomas Schiemann, Peter Böttcher, Johann Maierl, Ulf Tiede, Hans-Georg Liebich, Karl Heinz Höhne: Visualizing the Visible Dog. Technical Report, Institute of Mathematics and Computer Science in Medicine, 1999.